Batman Special #1, published by DC Comics, 48 pages, cover price $1.25. In honor of the theatrical release of The Dark Knight, I present to you one of the better Batman stories from the eighties, found in 1984's Batman-Special #1. The premise is straightforward, but intriguing. On the same night which saw the murder of young Bruce Wayne’s parents, a similar scenario played out in another part of Gotham City. Where the Waynes were taken by the bullets of a villain, however, the lives of another boy’s parents were claimed by the service revolver of officer Jim Gordon, Gotham’s future police commissioner. 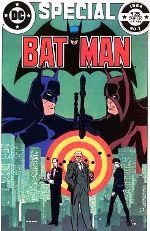 Now, Batman must protect Gordon from a man intent on taking murderous revenge on the City’s top cop. Writer Mike W. Barr pitches fans an engrossing story, wherein Batman comes face to face with “the player on the other side,” or, as the Dark Knight himself puts it, “My opposite number, a man as skilled, as obsessed as I am.” Even for those more familiar with the big screen interpretation of the character than his comics, I have to believe such a concept would be found interesting. To die-hard fans? Irresistible. I know. I am one. So, again, with The Dark Knight in mind, may I suggest this work as the next big screen adaption? No, you say? Too late. Batman Special #1 is recommended for any and all comics fans, because it’s comics done right. Find it at comics shops, as well as online retailers and auctions.